Leveraged loans (also called senior loans or bank loans) typically pay a two-part coupon—a market-driven base rate (30-90 day LIBOR) plus a contractual credit spread. 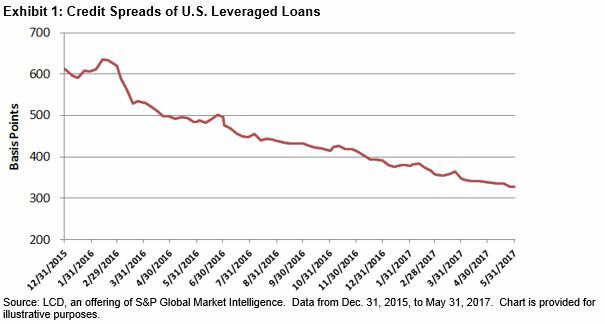 As shown in Exhibit 1, the weighted average credit spread of U.S. leveraged loans, as measured by the S&P/LSTA Leveraged Loan 100 Index, has fallen steadily and now sits at about one-half of where levels were just 16 months ago. Against a backdrop of anticipated rising interest rates, demand for the senior secured floating-rate asset class has created an environment that has benefitted issuers of bank loans. 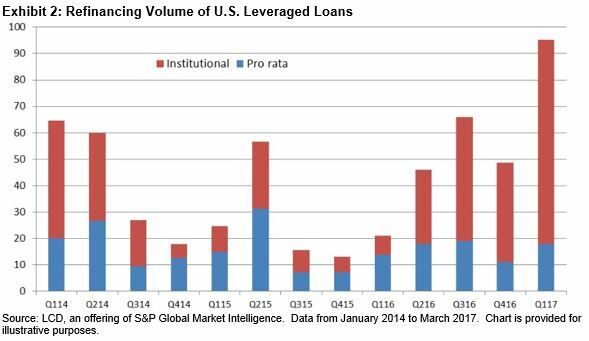 Given the high demand and relatively limited supply of new loan issuances, issuers have been able to renegotiate their credit terms (i.e., reduce the credit spread on the outstanding loan). This has been done through two processes: refinancing and repricing. 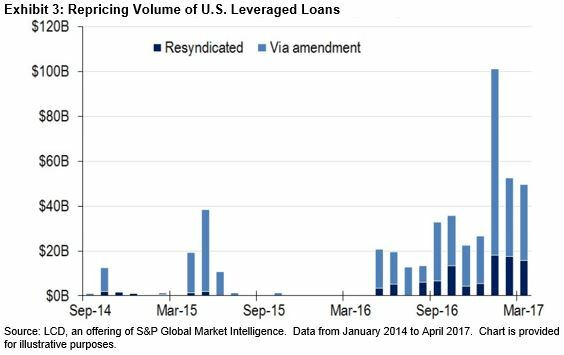 As shown in Exhibits 2 and 3, volumes of both refinancing and repricing have skyrocketed in 2017. 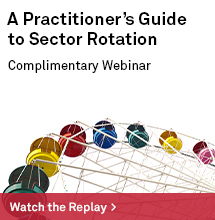 Generally speaking, loan repricings involve issuers reaching out to market participants via an arranger to lower the interest rate on an existing facility, with no other changes to the loan agreement. Refinancings, however, involve a new loan structure (i.e., new term, new agreements, etc. ), which replaces the existing facility. The existing loan that is refinanced is repaid at par, which could result in a further hit to yield if the loan was trading above par (as of May 31, 2017, approximately 60% of the S&P/LSTA Leveraged Loan 100 Index was bid at par or higher). Exhibit 4 shows a sample of some of the larger facilities that have repriced in 2017. As of May 31, 2017, over 300 facilities have repriced. The repricing impact has ranged from 25 to 350 bps, with an average of 70 bps. 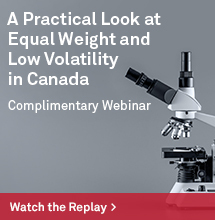 Despite the negative impact this activity has had on yields, there are several potential positives to take away from the current state of senior loans. 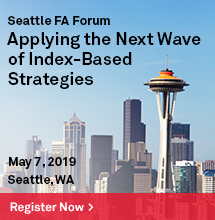 With the new, lower interest rates, most issuers have improved their fundamentals (i.e., stronger interest coverage ratios) and those issuers that have refinanced have extended their terms out with better financing rates. Therefore, in addition to being secured and senior in the capital structure, many bank loans may now have improved credit profiles. In addition, credit spreads are only one part of a bank loan’s coupon. The second part, and perhaps the most appealing aspect, is the floating component, which is typically based on LIBOR. 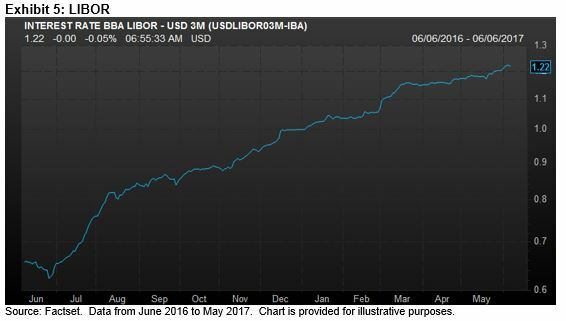 As shown in Exhibit 5, three-month LIBOR currently sits at 1.22%, up 22 bps YTD as of May 31, 2017, and over 50 bps since June 2016. Additionally, based on Fed Fund futures, the likelihood of a June 2017 rate hike currently stands at over 95%. Finally, compared with high-yield corporate bonds, senior loans offer lower duration risk, given the floating-rate nature. Rates on loans typically reset every 90 days, implying a duration of 0.25 versus a current effective duration of 4.18 on the S&P U.S High Yield Corporate Bond Index. So, in addition to having lower default rates and higher recovery rates than high-yield corporate bonds, senior loans offer significantly higher yield-per-unit of duration. 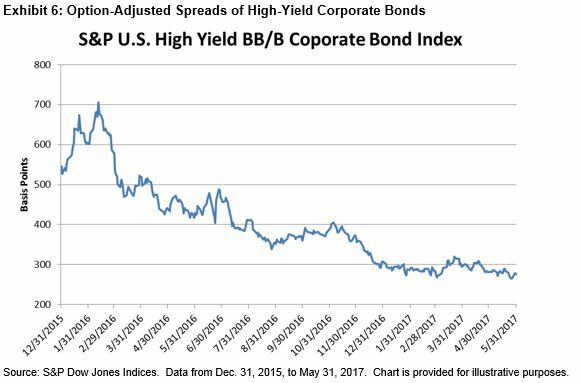 Furthermore, as shown in Exhibit 6, option-adjusted spreads in ‘BB’/‘B’ corporate bonds have tightened to levels not seen since 2014. 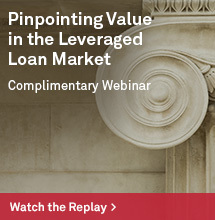 To learn more about the senior loan market and hear why loans may be an effective asset class for income and diversification, please join us on Tuesday June 20, 2017, for our webinar: Will the FOMC Continue to Fuel Interest in Senior Loans?